The Growing Growers Farmer’s Market today is hosting two book authors who are going to perform their children’s books through rapping, rather than readings. Shawn Elliot Russell, author of “Be Still Little Tree, Be Still,” writes about a young tree that experiences fear of strong weather events. He receives advice from a larger tree to “be still little tree, be still.” The young tree is told that some things in life we fear may actually be something good for us. In the book, the fearsome rain storms allowed the little tree to grow another branch, thus, experiencing something beneficial from something he once feared. Russell provides presentations of his book at local schools and events to encourage children to believe in themselves. 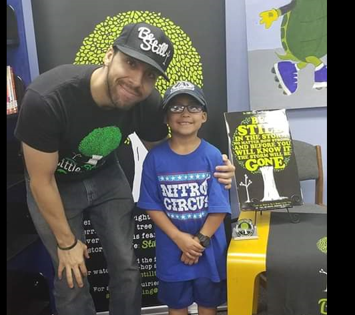 He was recently recognized by the McAllen Chamber of Commerce with an Innovation Grant to help promote his book and message to children. The second rap artist on the program is entrepreneur and book author Lamar Jones. Jones, creator of The Jank Barbeque Sauce, recently launched his children’s book, “The Adventures of Sir Jankster,” an autobiography and his will to follow his dreams in spite of those who have discouraged him. Jones wants to donate his profits to a scholarship fund for students. Copies of the books will be available for purchase, and the authors will be signing their books. “Be Still Little Tree, Be Still” is also available at Barnes and Nobel stores. The rap performance is scheduled for 10 a.m. This will be the first time these authors perform their books together. The Growing Growers Farmers Market is located in Firemen’s Park at the corner of 1st and Business 83 in McAllen. The market, with locally produced vegetables, fruits and beef, is open from 9 a.m. to noon Saturdays. Barbara Storz is a local horticulturist. Listen to her gardening radio show at 7 a.m. Saturdays on 710 KURV Radio. Her email address is bstorz@rcommunications.com.